With 2017 being a revaluation year for Nash County, which includes the city of Rocky Mount, property owners are beginning to receive revaluation notices. On average, assessments are dropping slightly across the county, down about 1.2%. However, this decline is largely attributable to a sharp decline in residential property assessments. Commercial property assessments are slated to go up. This article in 24/7 Wall Street by Tom Frohlich discusses the differing property tax burdens among the 50 states and ranks the states from the highest to the lowest property tax burden. As the article suggests, many factors play into each states' property tax burden, including what other taxes they have, or don't have, to fund government operations, the presence of large municipalities, the level of property values, etc. With 2017 being a revaluation year for Buncombe County, which includes the city of Asheville, property owners are beginning to receive revaluation notices—and most are seeing a significant increase in their assessed values. On January 25, 2017, a House Bill was filed that would expand the existing homestead property tax exclusion for disabled veterans and surviving spouses. The current exclusion, 105-277.1C, excludes from taxation the first $45,000 of the value of a permanent residence owned and occupied by certain disabled veterans meeting certain conditions or the surviving spouse of such a person who has not remarried. 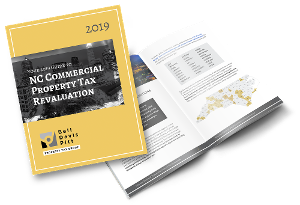 We recently authored an article about what Winston-Salem area businesses need to know about property taxes for the Winston-Salem Chamber of Commerce blog and newsletter. You can check it out here.